Between the cheerful flowers of spring and the vibrant foliage of fall, a variety of plants bloom during Central Park’s lively summer months. Visit these must-see spots in the Park this summer to find picturesque blooms. In addition to lilies, you’ll find hydrangeas, asters, roses, trumpet creepers, and dozens of other flowers in Shakespeare Garden this summer. Central Park’s only formal garden features lots of color across its six acres. The Garden is divided into three smaller gardens, each with a distinct style: the northern is a French-style garden; the center, an Italianate garden; and the southern is an English-style garden. More than 150 different annual cultivars will bloom through mid-October in the South and North Gardens. Look for the princess flower, a tropical shrub with large, fuzzy silver-green leaves and royal purple flowers; and ornamental and hybrid sages in a rainbow of colors. In the South Garden, admire several perennials including the balloon flower, a blue and bell-shaped bloom with buds that resemble origami balloons; phlox in pink and white; ornamental grasses; Japanese anemones in white and pink; and tall, native flowers such as the shining coneflower and Joe-Pye weed. Conservatory Garden’s South Garden features many summer-blooming annuals and perennials, in addition to pink, blue, and green waterlilies at Burnett Fountain. At the heart of the South Garden is Burnett Fountain, with a pool featuring a variety of summer-blooming waterlilies in pink, blue, and green. Relax on one of the nearby benches and admire the bright pink crape myrtle surrounding the Fountain. You’ll find colorful hydrangeas and roses throughout the South Garden as well. Want to discover more? Take our staff-led Conservatory Garden Tour to learn about the Garden’s history, design, and blooms from the people who know it best. Shakespeare Garden is a four-acre landscape named for the famed English poet and playwright William Shakespeare. It features more than 100 plants mentioned in the Bard’s works. The Garden is just steps away from the Delacorte Theater, home to Shakespeare in the Park, a New York City summer tradition. 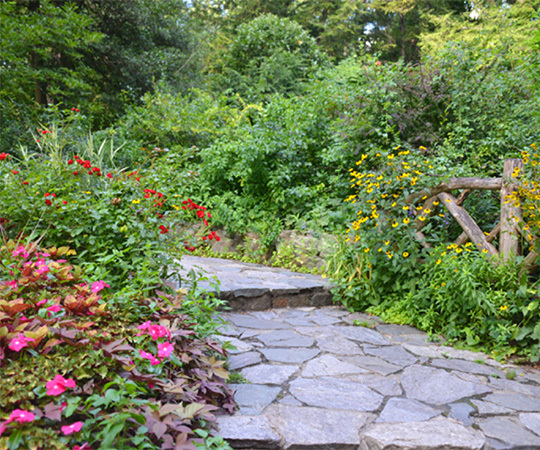 Shakespeare Garden — next door to the Delacorte Theater, home of Shakespeare in the Park — features more than 100 plants from William Shakespeare’s works. 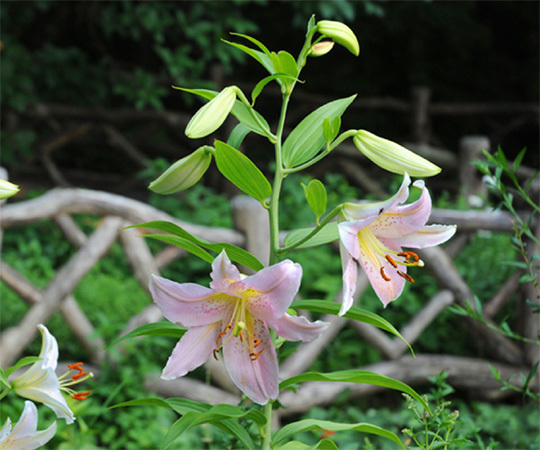 Throughout August and September, you can expect to see lilies, phlox, hibiscus, asters, roses, cyclamens, and dozens of other flowers in a variety of colors. Look for the trumpet creeper, a vine with bright red or orange tube-like flowers that attract hummingbirds. Visit the middle of the Garden to find the white blooms of the sweet autumn clematis on the bamboo fence. Its fragrance perfumes the entire Garden. Want to learn more? See our recent blog post on Shakespeare Garden’s unique attractions, including 10 small bronze plaques that feature Shakespearean quotes. This is the first full summer to explore the Dene Slope, a vibrant native meadow that opened in September. In addition to a variety of grasses, you’ll find butterfly weed, which features clusters of small orange flowers; and anise hyssop, a purple flower with a lovely scent. 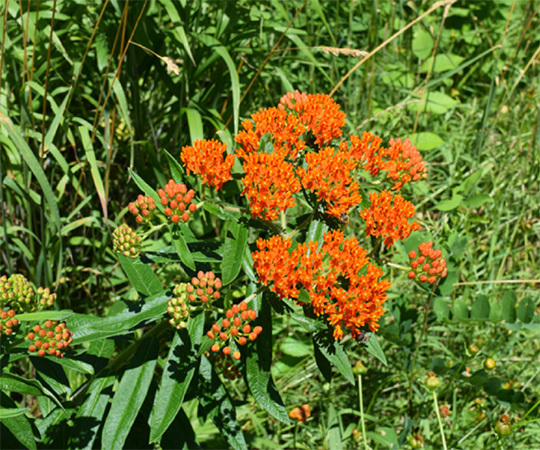 From May to September, look for the small orange flower clusters and hairy stems of the butterfly weed in the Dene Slope. Mourning doves, monarch butterflies, hummingbirds, caterpillars, and other wildlife have been spotted in the Dene Slope. This area also features a trail that leads to a rocky outcrop at the top of the hill and a rustic bench made by our three-person rustic crew. Want to know what it takes to establish a new native meadow? See our blog post on how the Conservancy transformed a weedy, eroded hillside into the Dene Slope. From Cherry Hill to the North Woods, there are still so many other areas in Central Park with summer-blooming plants — visit our official Bloom Guide to learn more. Wherever you find yourself admiring summer blooms in the Park, we hope you’ll share the stunning colors with us by tagging @centralparknyc and using the hashtag #CentralParkBloomWatch.